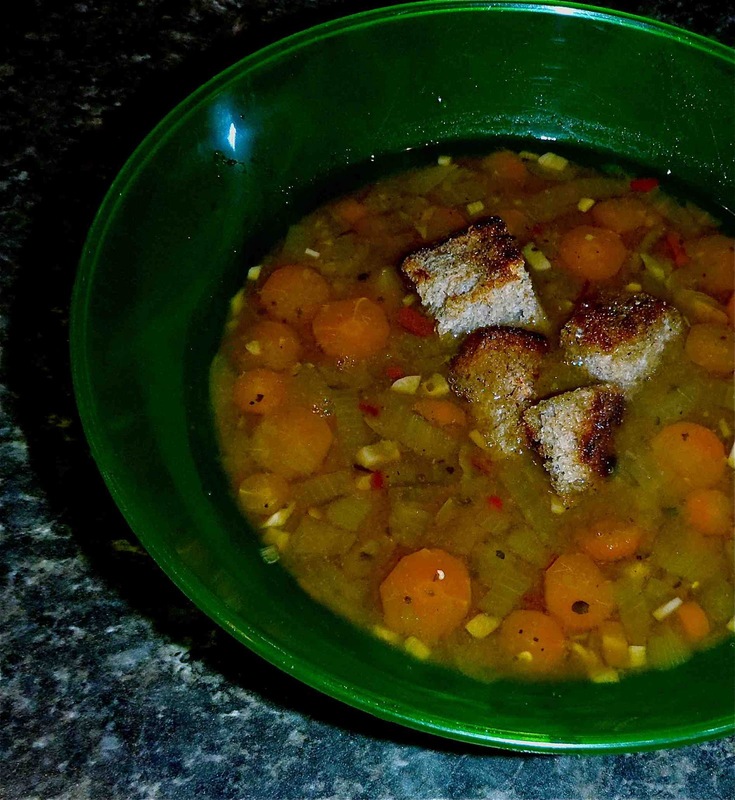 If your looking for a great soup that you can prepare in no time, and let your slow-cooker do all the work, try this wholesome flavorful dish. Put it all together in the morning, go outside, get a nice hike in or a run. Get your errands done, do some grocery shopping, take your kids to the park, or go to work. Come home to a dinner that is ready for you. That is what I call multi tasking! Top with garlic croutons and crispy smokey coconut bacon! Put all ingredients except liquid smoke in slow cooker. Cook 6-8 hours on low. Add liquid smoke before serving. Add garlic croutons and serve immediately. Let slices of bread dry out on a paper towel for about a ½ hour (or use day old bread, bread going stale). Cut bread into 1inch squares. Drizzle each square with olive oil, and sprinkle garlic powder, salt, and pepper. Toast in oven or toaster oven, turning once until crispy and golden brown. You can also opt to pan fry them over med-high heat until crispy and golden brown. Preheat oven to 300º. In a bowl, stir well to combine all ingredients. Spread into a thin layer on a baking sheet lined with parchment paper. Bake 10-20 minutes, stirring it up every 5 minutes or so, until dry and crispy. Allow to cool. *You can also make this in a nonstick pan over medium heat, instead of the oven. It may take a little dash of olive oil to get it crispy. Sauté about 10 minutes, stirring often. Obviously nobody enjoys getting sick. You know by now I'm a firm believer in using food as preventative medicine. If I get sick, which is very rare, it lasts about 1 day and it's over. A plant based diet is the absolute best way to boost your immune system. This is a delicious way to prevent or battle a cold or worse. The superfood antioxidants and vitamins in kale, spinach, garlic, and lemon work together with the probiotic active cultures and nutrients in miso and nutritional yeast. I guarantee your cold doesn't stand a chance. Consider it like a tasty edible flu shot! 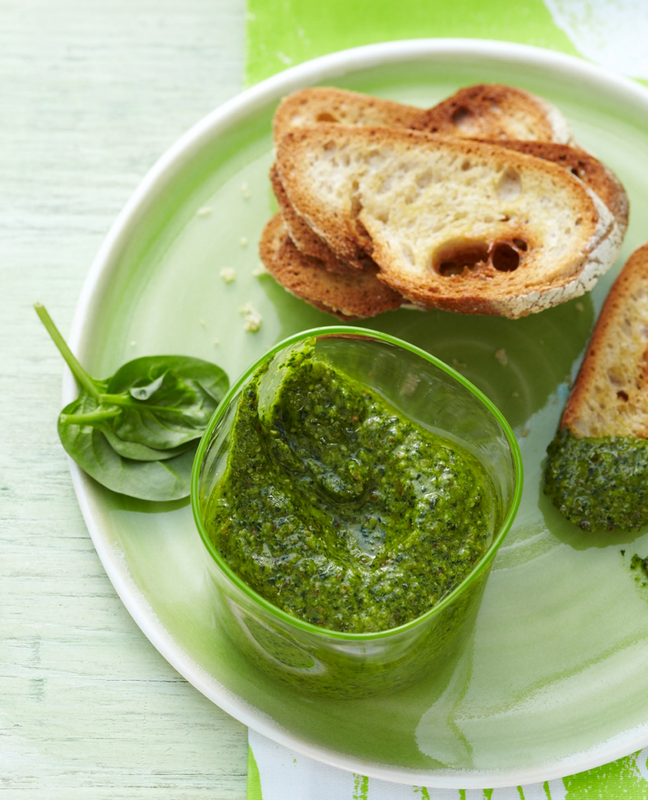 Try this pesto mixed into a bowl of cooked brown rice, spread on crostini, or tossed with some cooked squash or sweet potato. It balances great with a sweeter cooked vegetable or grain. The possibilties are endless, and the flavor is excellent. Process all ingredients in a food processor or blender. If you don't have a processor or blender: Mix the lemon juice and miso together first until smooth. Make sure the garlic is grated on the smallest size grater like a zester or a hard cheese grater. Hand mince the greens very fine and stir to combine. *If you're battling an illness that happens to include nausea, add about an inch of fresh grated ginger to the list of ingredients. This will help settle your stomach. I recommend mixing with cooked rice afterwards.